The Flat-headed Cat (Prionailurus planiceps) is a small wild cat from forested areas, mainly near water, in Peninsular Thailand, Malaysia (both East and West), Brunei, and Indonesia (Kalimantan and Sumatra). It is considered vulnerable by IUCN due to habitat loss and pollution. It is very rare in captivity, with only two individuals - both in zoos in Malaysia - recorded by ISIS in early 2008. Like most other small cats, it has often been placed in the genus Felis. It has a head-and-body length of 41-50 cm (16-20 in), and a short tail of 13-15 cm (5-6 in). It weighs 1.5-2.5 kg (3.5-5.5 lbs). The thick fur is generally dark reddish-brown tinged grey, with a more reddish head and whitish underparts. Except for the relatively faint facial streaks, it is rather unpatterned. The legs are fairly short, and the ears are short and round. The shape of the head is atypical for a cat; the skull is fairly long, while the skull roof, as suggested by both its common and scientific name, is rather flat. It occurs in both secondary and primary forest, and most records are from near water. It mostly hunts for frogs, fish and crustaceans, but will also catch rats and chickens. 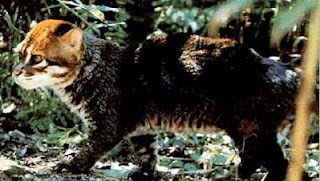 It has relatively long premolars, and is one of the few cats that is unable to retract its claws (the others being the cheetah, fishing cat, and the Iriomote cat). These adaptions combined with its behavior have resulted in comparisons with semi-aquatic mustelids, and it is known for readily entering water. Overall, however, little is known about its wild behavior, but a gestation period of about 56 days, and a litter size of 1-2 kittens have been reported in captivity. Captive individuals have lived for 14+ years. It is generally considered a nocturnal animal, but observations of captives suggests it is crepuscular. 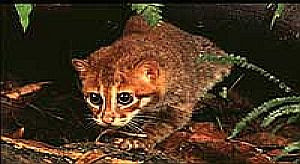 The Flat-headed Cat is considered vulnerable by IUCN and listed on appendix 1 by CITES. The total population is believed to be less than 10.000 adults, with no single sub-population containing more than 1.000 adults. While habitat loss and water pollution are serious threats, sightings from oil palm plantations suggests it is less specialized than generally believed. 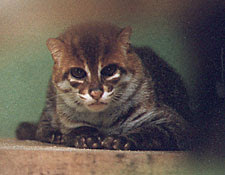 The Flat-headed Cat is fully protected throughout its natural range, except in Brunei, where this species lacks legal protection. Sightings are generally very rare.